Diplomat Blades offers a new range of safety gloves designed for hand protection during large animal handling and other dangerous applications. HexArmor Hercules - 400R6E safety gloves protect workers from vicious cut or puncture hazards. The safety gloves can also be used in dangerous applications such as handling razor wire or preventing animal bites. HexArmor Hercules - 400R6E safety gloves combine innovative industrial puncture protection with industry-leading cut resistance to provide really effective performance in dangerous situations. 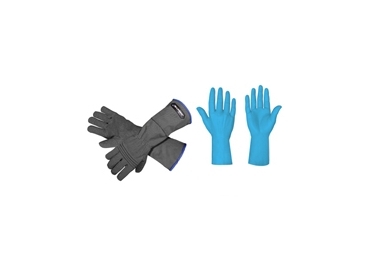 The safety gloves are made with SuperFabric material for extremely high cut resistance. Industrial puncture protection is provided over the entire hand from wire, metal, wood and glass. Suitable for high-risk environments, HexArmor cut-resistant gloves are engineered to provide users with high levels of protection, helping to reduce injuries and lower PPE costs in harsh working conditions.